OK, I told ya I was on a pumpkin binge right now. I made a flannel covered pumpkin, a punker pumpkin, some pumpkin house numbers and now… a Zebra Striped Pumpkin. I may, in fact, have a bit of a pumpkin problem. Thanks to zebra print duct tape, this entire process took me about 3 minutes. I had a fake Dollar Tree pumpkin which I sprayed silver, but then changed my mind and decided to cover it. I tore the duct tape into short strips, then tore those strips in half, length-wise. I tried to match up the stripes, but didn’t get too twisty if I couldn’t make it work. I’m working on several other black and white pumpkins and will group them all together for Halloween. Less than 3 minutes for less than $3. Good grief, I am cheap and easy. Sad. ****UPDATED 9/28/11: This zebra stripe is from Duck Brand. They just released some new patterns for Halloween, one of which has skulls all over it! And also? Happy Anniversary to Handsome Hubby. I’ve loved him all my life and I am so dang blessed that I get to share his. Your kids had better run for their life….of they will be the next thing covered in tape! This is your best pumpkin yet. My husband is looking forward to the Punkin I make! Happy Anniversary!! 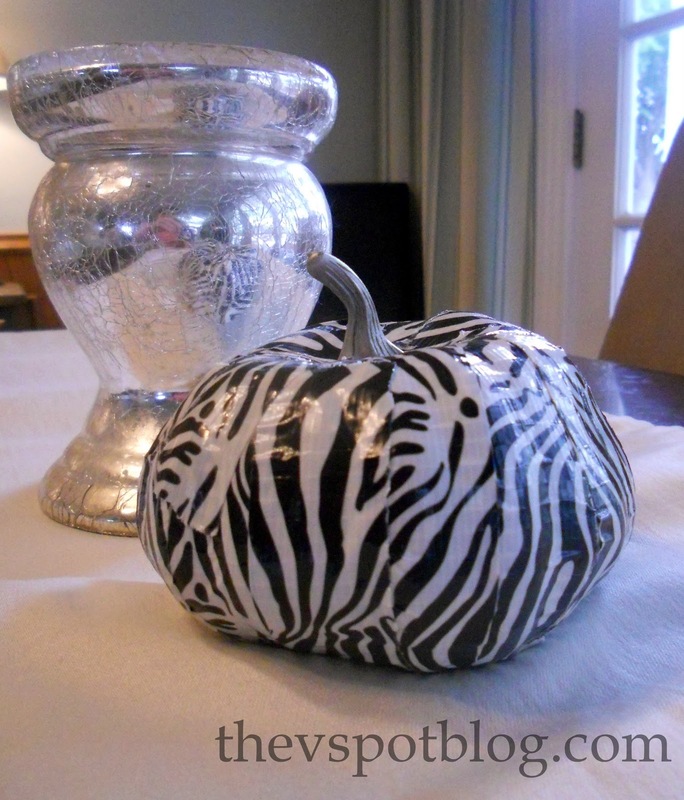 And I love this zebra pumpkin…that’s a great statement piece!! Fabulous Viv! Loving all the black and white. And Happy Anniversary! I need to go pick up some cheetah tape for Honey! Happy anniversary…I love your love story! You are a crafty, crafty girl. Secondly, Happy Anniversary to you and your husband. And best wishes for many more anniversaries! Oh, you could be worse things than cheap and easy 🙂 Happy Anniversary!!!! A zebra printed pumpkin? Get out! Fabulous idea! Happy Anniversary, Viv! I hope DH does something nice for you tonight! That adorable zebra pumpkin would go perfect in Emma Kate’s room! I LOVE IT! This is awesome! So…so…so awesome! I love good zebra print and love it even more on a pumpkin! And thanks so much for the comment you left me earlier about the ceiling medallion. You rock! Zebra pumpkin looks great. You’re inspiring me. Uh-oh! Happy Anniversary! Also, it’s my first blogiversary, I’d love if you stopped by to check out my giveaways this week! Love this! How clever and easy! I have some pumpkins from last year that I wanted to redo and I think that this would be perfect for them! I am stopping by to say hi because I just registered for the SoCal Social!! I look forward to meeting you next weekend! Hope you have a great week!! I found the zebra striped duct tape a few months ago and love it! I love how the pumpkin came out! You truly ARE the pumpkin queen! LOVED this – — I see all of those cute duct tapes and always want to figure out something to do with them! Love your zebra pumpkin! When I was in Target the other day I had that exact duct tape in my hand but then left without it. Now I may have to go back and get it. What a great idea with the duct tape. Love it. Thanks for sharing at my Fall into Fall party and for your kind comments. Don’t worry about the blob…no big deal. Adds to the character of the party. I am absolutely loving these pumpkins. There are so many great duct tape patterns you could try. This is so much fun!! I love it. I’m going to a baby shower in a few weeks where they asked guests to bring a painted or carved pumpkin – this sounds like a cuter idea! That is about the cutest pumpkin I’ve ever seen!! Love it! Found via Savvy Southern Style. You’re very welcome to link up this one to my new linky party here – http://ivanna.blog.com/linkparty01/ . It has already started. Make yourself at home :). Love this!! I am obsessed with zebra print, so I may just have to try it! Great idea! Found you through TCB…screamingly cool idea! I may have to duct tape myself for Halloween just to match! i am allllll over this zebra pumpkin!! sooo incredibly cute!!!!! i can’t wait to make one myself! Love the zebra pumpkin!!! Awesome!! such a FAB idea! Love it! Who would have ever thought of this?!? You are brilliant! What a cute idea! Especially since it can be placed inside AND outside! I imagine a lot of the painted and bejewelled pumpkins out there would basically melt if rained on. I just saved this idea to my favorites… so cute! I saw this at Just a Girl and had to come and see it. Don’t you just love zebra print duct tape? Your pumpkin turned out great! I’d love for you to come check out my zebra duct tape shoes. Looks great. Never would have thought you used tape! This has to be the cutest (and simplest) idea I’ve seen in blogland in awhile. I don’t know how it occured to you to use duck tape but I’m so glad you passed the idea along. They make the tape in so many neat patterns now that I see lots of decorated pumpkins in my future. So clever…thanks so much! Bwahahahah! Total Wiley E. Coyote, Super Genius kind of a craft, girl. Love this! Now I have to buy more pumpkins! Very fun, Vivienne! That “Duck” brand duct tape is crazy! Fantastic idea! Love zebra duct tape! i love it! so cute. i’ve seen that zebra duct tape and I want some! Hi Vivienne, Thanks so much for linking this to my party. I love it! With your permission, I’d like to make a pumpkin like it & include it in my TV segment next week. I totally love it! That is a whole new level of duck-taping. Thanks for sharing!! Cute idea! I love zebra too! New follower and I would love to have you follow me back! This is insanely cute. Love it! SUPER cute—is there anything that duck tape can’t be used for? Humm….. nope! Even Halloween deco! LOVE it… my sister loves zebra, may have to try this! Popped in from Tip Junkie! This is truly an extrodinary idea! I cannot believe I haven’t came up with this sooner. I mean it’s so easy to come up with the idea, guess I am just not that creative! Thank you so much for posting this! I am always looking for creative to make things like pumpkins more creative! Not to mention the zebra stripes and it’s cheap! Thank you sweetie! what an amazing idea and super simple! thanks so much for sharing it with everyone! Using garlic in your Halloween decor – keep your pantry stocked AND keep vampires away.